The report on the recent public inquiry into the refusal by South Northants Council of planning permission for the Helmdon/Greatworth Spring Farm Ridge Windfarm was published on Thursday 12th July. The government inspector, Elizabeth Fieldhouse, has decided to allow the appeal by Broadview Energy Limited and grant permission for the erection of the five 125 metre high wind turbines and ancillary development. Other than the unlikely event of a sustainable legal challenge to the decision, this means that the turbines will now be erected and operational by the end of next year. On reading the report without knowing the conclusion, one might be forgiven for assuming that the appeal was going to be dismissed. Inspector Fieldhouse accepts the evidence given by the District Council, the County Council, three Parish Councils, the Helmdon Stuchbury and Greatworth Action Group and concerned local people that considerable harm would occur to the unspoilt and tranquil local landscape, to the many important heritage assets, to the residents closest to the site and to people on foot or horseback enjoying the local bridleways and footpaths. The proposed turbines, some 1300m to 1350m away, would be conspicuously out of scale with the intimate river valley landscape and become a dominant feature with adverse impacts on the perceived small scale landscape. They would contrast harmfully with the viaduct over which they would visually dominate and tower. The turbines would occupy about 30% of the view but turbine T4 would be viewed close to or behind the Church. It is likely that the whole or at least part of the rotating blades of all five turbines would be visible, dominating the skyline. The nearest turbine would be some 2.8 km away but from this particular view the proposed turbines would become a key feature at odds with the scale of the settlement and the prominence of the church tower. From the network of ProWs (footpaths) and the BOAT (byway open to all traffic) that pass though the appeal site, the proposed wind turbines with moving blades would be a marked distraction and create features that would be alien to the rural character. When approaching along the BOAT….the scale of the turbines would be very keenly perceived and dominant…..the peaceful tranquillity of the area would be changed by the rotating blades that would contrast harmfully with the modest scale of parts of the landscape, its patterns, undulations and textures. …from some viewpoints, particularly along parts of the ProWs and BOAT, the proposed turbines would become a key feature at odds with the scale of the landscape on which the proposal would have an adverse impact. All the relevant parts of RSS policies 1(g) and 26, LP policies G3 and EV2 and CS policy S11 that broadly aim to protect and enhance the natural countryside would not be met. “…both turbines T2 and T3 would be under 200 metres from the BOAT (byway open to all traffic) that forms the important link between the limited number of byways in the area. The proposed development would be unpleasantly imposing and pervasive to the occupiers of Stuchbury Hall Farm who work the adjoining land”. So why, then, has she seen fit to allow the appeal and thus ensure that all the harm she acknowledges will actually take place. As far as this impact upon the setting of Sulgrave is concerned she agrees that the full of height of all five turbines will be seen just as shown on this montage but “…the expansive views of pastureland, copses and hedgerow trees would reasonably accommodate the wind farm without it appearing to be at odds with the foreground landscape or the setting of Sulgrave (my italics). As far as this impact on the setting of Sulgrave is concerned she agrees that the turbines would appear on the horizon as shown and would become “a key feature at odds with the scale of the settlement and the prominence of the church tower” but the answer is apparently for the viewer to move along the footpath to a point where there is some separation between tower and turbine for all to be well and somehow the turbines to be no longer at odds with the scale of the settlement. The Inspector reports that “….the peaceful tranquillity of the area would be changed by the rotating blades that would contrast harmfully with the modest scale of parts of the landscape, its patterns, undulations and textures. It is very interesting that the National Planning Policy Framework upon which the inspector places such weight in reaching her conclusion states that planning decisions should: identify and protect areas of tranquillity which have remained relatively undisturbed by noise and are prized for their recreational and amenity value for this reason. There is, however, no reference to this important NPPF requirement although the inspector acknowledges that “..the proposed development would be a visible presence in the area and result in the loss of a perception of tranquillity….” Somehow, apparently because of the “filtering/screening effect of vegetation” and “twists and turns along the route” the tranquillity is restored and the inspector finds “no significant harm….in relation to the usage of public rights of way. It then became necessary for the turbines to be moved to avoid bat habitats and it was clearly no longer possible to meet this guidance. In the process of setting criteria and choosing sites which met them one might have expected the company to conclude at that stage that this site was too constrained and it would be sensible to search for suitable locations for renewable energy projects elsewhere. On the contrary, if the scheme does not fit the criteria, why not change the criteria? In its evidence to the inquiry, the British Horse Society advised that turbines should be at least 200 metres from routes used by horse riders. In using what the Inspector calls “ the important link between the limited number of byways in the area” riders will be forced to run the gauntlet of turbines on either side of the route, both closer than 200 metres. So how are these significant impediments to the continued enjoyment of ancient rights of way to be overcome. Pedestrians wishing to walk the direct route from Greatworth to Helmdon but “unnerved” by the nearest turbine will be offered the alternative of a permissive path taking them out of their way down into the nearby valley. For some reason “the shortfall on the separation distance (for horses) from the byway carries limited weight” (i.e. it simply doesn’t matter) because, apparently, “…to all but the most highly strung horse the wind turbines are unlikely to be a surprise or frightening.” So that’s all right then. 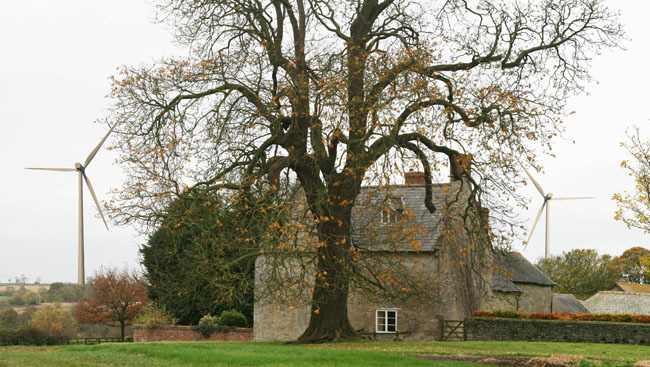 In respect of Stuchbury Hall Farm, the residents will no doubt be re-assured to learn that the “unpleasantly imposing and pervasive” turbines will not render the proposal “overwhelming or inescapable” because of the “existing mature trees”. This despite the acknowledgement that “without the mature trees, the southern aspect of the house would be dominated by the rotating blades of the wind turbines”. What price this shelter when these deciduous trees are without their leaves and indeed when they have exceeded maturity and ceased to exist? In the “Overall Balance and Conclusions” section of her report, the Inspector explains that in reaching a conclusion, government policy requires her to weigh in the balance the wider economic and environmental advantages of the proposal. Given the magnitude of the disadvantages which have been acknowledged, these advantages must clearly be highly significant to tip the balance towards allowing the appeal. Equally, the detailed way in which the disadvantages are catalogued must surely merit a similar demonstration of the advantages. In the final paragraph of the “Overall Balance and Conclusions” we learn that “…overall the totality of the impact of the proposal, including conflict with development and emerging plan policies, is not sufficient to outweigh the wider economic and environmental benefits of the proposal”. Having heard many times during the inquiry that mere assertions are unacceptable and hard evidence is essential we turn the page to look for the detailed evidence to back up this bland assertion. We are disappointed. Where are the demonstrable facts which enabled the balancing exercise to be carried out? There is merely a statement that “…the (National Planning Policy) Framework provides the most up to date expression of national renewable energy policy….and this is a material planning consideration to which I give significant weight”. Despite early coalition government assurances to the contrary, inspectors continue to interpret this national policy as insisting that the benefits of every planning application for a renewable energy scheme, in terms of carbon dioxide savings, must be given significant weight, even where these savings are demonstrably insignificant. The UK currently emits 540 million tonnes of carbon dioxide (CO2), the key greenhouse gas culprit every year. We need to switch to forms of energy that do not produce CO2. Wind energy generation is one of the most cost-effective and advanced renewable generation technologies and the UK is one of the windiest countries in Europe. The Spring Farm Ridge Renewable Energy Project, while small in size can still play a significant part in reducing CO2 emissions! The only possible inference that can be drawn from this is that the project will play a “significant” part in reducing the 540 million tonnes emitted by the UK every year. The newsletter does not say how many tonnes of CO2 the company consider will be “saved” by the Spring Farm Scheme. However, it is possible to extrapolate information on similar projects from the company’s website which suggest that the figure might be in the region of 14,000 tonnes per annum. It will be of no consolation to local people that the Inspector somehow felt compelled to regard this demonstrably insignificant contribution to the fight against global warming as sufficiently significant to outweigh the many disadvantages which she acknowledged. Huge local disappointment at this conclusion does not imply any personal criticism of Inspector Fieldhouse, whose unfailing courtesy and impeccable attention to detail impressed everyone attending the inquiry. The policy constraints within which she makes her decisions are not of her making. 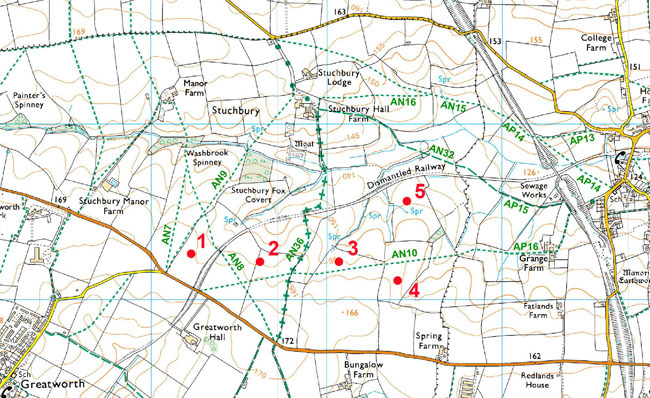 Having said that, it is instructive to look at another of her appeal decisions in respect of a windfarm application, also in Northamptonshire where she concluded that the harm to the setting of a remnant of the cold war, namely a former Thor missile site, would outweigh the wider environmental benefits of the proposal, presumably similar to those considered to be so important here. The apparent inequalities in decisions made where one of half of the balance to be struck always comprises a simple statement in respect of the wider environmental benefits without any attempt at quantification would seem to render the appeal process in respect of wind farms a complete lottery. The government’s much vaunted “localism agenda” has repeatedly been used to imply that local communities will have a key role to play in determining the future of their areas. The impression has been given that renewable energy proposals will be directed to where people demonstrate their willingness to accept them, to take part in the development and hopefully derive some meaningful local benefits from them. If the “localism agenda” means anything, it must surely follow that a demonstrable lack of such willingness would be an important factor in making the decision on an appeal such as this one. From the documentary evidence and the appearances of representatives of parish councils and individuals the Inspector could have been in no doubt as to the overwhelming level of public objection to the windfarm proposal and the total lack of support by the local community. Nevertheless, there is not the slightest acknowledgement in the report that this important factor has played any part in the decision making process. Indeed, no one reading the report would be able to conclude whether local communities supported or opposed the scheme. Andrea has worked tirelessly on behalf of villages threatened by wind farms and high speed rail lines and we can only wish her well in this latest setback. Many Sulgrave villagers have expressed their grateful thanks for the tireless efforts of members of the Helmdon, Stuchbury and Greatworth Windfarm Action Group and are sincerely sorry that these should have been in vain. If there is any comfort to be had from this long running saga it is the solidarity which has been shown in the village and the many new friendships which have been formed. Read Inspector Fielding’s report in full. This entry was posted on Monday, July 16th, 2012 at 2:46 pm	and is filed under News. You can follow any responses to this entry through the RSS 2.0 feed. You can leave a response, or trackback from your own site. Did this really horrid development ever go ahead? Following a second public inquiry, the Government Inspector recommended that the project be given planning permission. However, he was overruled by the Secretary of State who directed refusal. The developers took the matter to both the High Court and the Appeal Court. On each occasion the Court upheld the Secretary of State’s decision. The proposal has now been abandoned by the developers.